That last one missed perhaps the most pertinent item in what otherwise might have been a mild distraction for a slow news day: The “Swedish girl” in question was just eight-years-old. Forget The Sword in the Stone; this sounds like a Disney animated classic in the making. 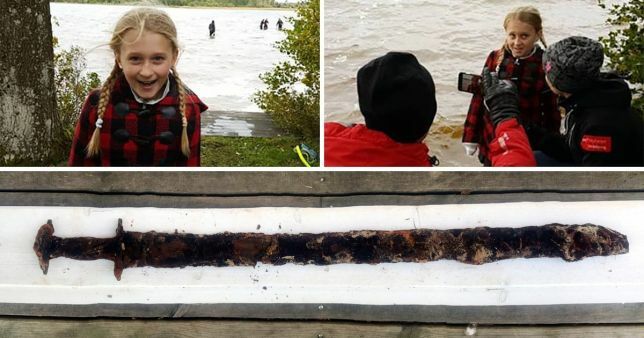 An eight-year-old girl, Saga Vanacek, pulled a 1,500-year-old sword out of a lake in southern Sweden this past July. Her find was announced only this past week for fear it would trigger a summer tourist stampede to the sleepy hamlet of Tånnö on the shore of Lake Vidöstern. Forgive all the umlauts, but this is Sweden we’re talking about here. According to local news in Sweden — the local news site local.se, followed by the regional Värnamo Nyheter newspaper, followed by national radio — and picked up virtually overnight by media across Europe and the U.S. and Canada, experts from the nearby Jönköping county museum estimated the sword, found still in the remains of its original wood and leather scabbard, dates back to the 5th or 6th century AD, give or take a couple of pre-Viking generations. Saga’s father, Andrew, admitted in a Facebook post that he was annoyed at first: He had been waiting impatiently for his daughter to come in from the water because, godammit, the World Cup final was about to start and Croatia was about to face France, and it was Croatia who had knocked out England, who in turn had knocked out Sweden, and so therefore deserved to pay the price. His daughter was skipping stones, however, when she suddenly held up a rusted artifact she found in the water. He wasn’t thrilled at the prospect of hauling the find home — who knows where it might’ve been? — but neighbours convinced him it looked “kinda old,” and so he called an archaeologist the following morning. Readers of The Local’s news site started a campaign to have Saga declared the rightwise Queen born of all Sweden. The post of prime minister is currently held by Stefan Löfven in an acting capacity only, but one has to be at least 18 to be PM, rulling Saga out. Sweden, officially known as the Kingdom of Sweden, already has a monarch — King Carl XVI Gustav — but why spoil the beauty of a thing with mere detail? There is a serious side to a fun story. A team of forensic pathologists and archaeologists is poring over the sword, trying to pin down its provenance. The question of whether Saga will be rewarded or involved in future projects has been referred to the National Archives of Sweden — a body not exactly noted for its romanticized view of historical events. See? There must be a movie in there somewhere. Newer Post“Nice” is in, controversy is out at Wildlife Photographer of the Year 2018 awards.